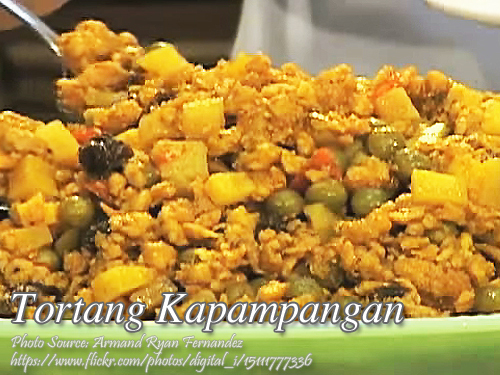 This recipe is a Kapampangan version of the famous pork giniling dish. Cooking this dish is very simple and it can be cooked in ordinary days but can also be served in special occasions. It can also be cooked by a beginner so don’t be afraid in trying to cook this dish. I guess the reason why it is called tortang Kapampangan is because it contains egg and torta is actually an omelet. So in this case it should be a pork omelet but the egg use in this dish is not enough to make it as an omelet. I think the egg serves as a binder to the ground pork. Also, the ground pork is prepared first before cooking by combining the pepper, calamasi, salt and beaten egg then mixed together. Combine annato seeds and cooking oil and let it stand for an hour. Then rub the seeds while soaked in the cooking oil to release the red coloring in the oil. Discard the seeds and set aside. In a bowl, combine ground pork, pepper, 1 tablespoon of calamansi juice and 1 and ½ teaspoon salt. Mix all the ingredients using your hands by squeezing the ground pork until all the ingredients are thoroughly mixed. Then add the beaten egg and continue mixing until the pork mixture is coated with the egg. Set aside. In a medium size wok, heat 1 tablespoon of oil and saute the red bell pepper for 1 minute. Remove from the wok and set aside. In the same wok, saute garlic until fragrant. Then add the onions and saute until soft. Add the annato oil in the wok and continue sauteing the garlic and onions while adding the minced tomatoes and laurel leaf. Then add the ground pork mixture and stir cook. Cover and let it simmer until the pork is tender, about 25 minutes. Then add the raisin, bell pepper, and the rest of the salt (1 teaspoon) and potatoes. Stir cook and add a little water if necessary, about ¾ cup. Cover and simmer until the potatoes are half done. Add the green peas and star margarine then stir until the margarine coats all the ingredients. Cover and simmer again until the potatoes are cooked. Serve hot with steamed rice.